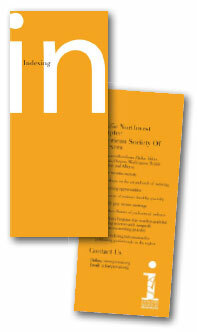 A chapter brochure (view pdf version) has been designed by Simon Black, a Portland graphic artist. Simon worked with Jane Henderson who solicited input from chapter members at the 2007 fall chapter meeting in Vancouver, Washington. The brochure has been professionally printed and folded in color. Every member who would like brochures to use in marketing your own business may receive fiv color brochures free of charge. Additional color brochures may be purchased for $0.50 each. Those of you who have speaking engagements through the Speakers Bureau may order whatever quantity you need. Requests should be sent to Jane Henderson by email or 2939 NE 19th Avenue, Portland, Oregon 97212. A check made payable to PNW/ASI should accompany your order, if applicable. If you like Simon Black’s work and want to contact him on your own behalf, go to his Website at www.moterepublic.com, send email to simon@moterepublic.com or phone 503-975-5805.